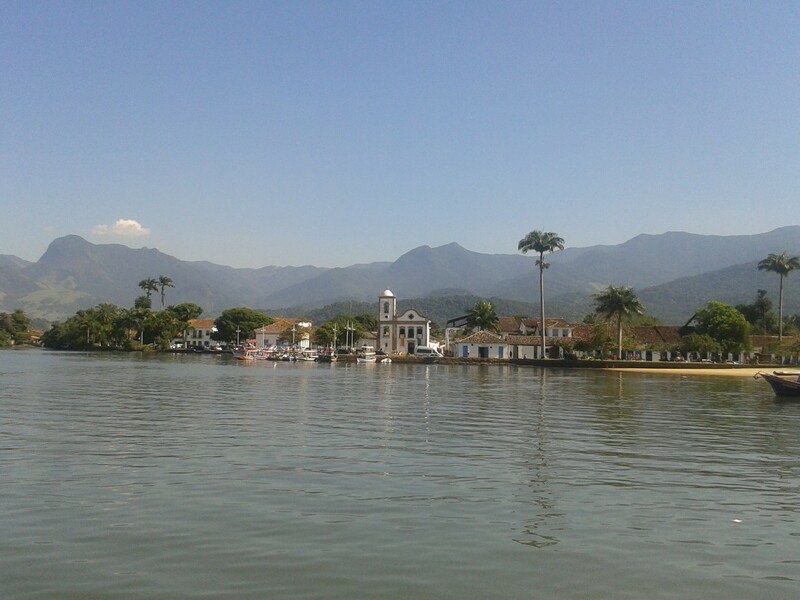 FLIP (Festa Literária Internacional de Paraty), a literary festival founded by Liz Calder of Bloomsbury Publishing, recently celebrated its 12th year in Paraty, Brazil, a picturesque colonial town on the coast about halfway between Rio de Janeiro and São Paulo. The festival pays homage to a different Brazilian writer every year and this year they honored Brazilian writer Millôr Fernandes. Panel discussions and readings took place continuously over five days, featuring an international group that included writers Jhumpa Lahiri, Eleanor Catton, Daniel Alarcón, Juan Villoro, Silviano Santiago, and Etgar Keret as well as journalists Andrew Solomon, Michael Pollan and David Carr. Seats in the “authors’ tent”, where the main events are held, sold out twenty-four hours after they went on sale, but screens were set up throughout the city, some broadcasting panels in their original languages and other areas with simultaneous interpreting in Portuguese. Other events (Off-Flip, Flipinha, FlipMais, and countless others) take place at the same time. All of this means that anyone in Paraty at the end of July could turn a street corner and see a poem appearing and disappearing from a wall, as someone pressed buttons on a computer on the opposite side of the street to project the text digitally while musicians who are added a live soundtrack. The spectator could walk down the block and stumble across a book release party, hear young people reciting poetry in a plaza, or walk into a random building and find a discussion on the role of literary agents. The festival takes over the entire city. 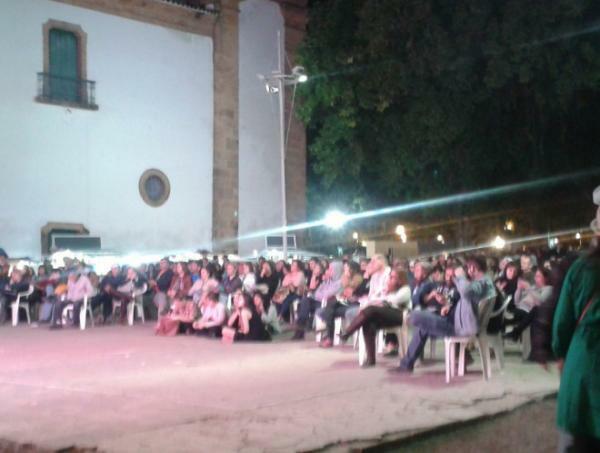 A crowd watching David Carr (U.S.A.) and Graciela Mochkofsky (Argentina) on Saturday night at one of the outdoor screens set up in the city. Journalist Andrew Solomon (U.S.A.) spoke eloquently about his personal battles, woven beautifully into his research and writing, Silviano Santiago (Brazil) and Mathieu Lindon (France) spoke of friendships that had influenced them, and Daniel Alarcón (Peru/U.S.) launched his second novel At Night We Walk in Circles in Portuguese translation. One of the most popular panels this year was “The True Story of Paradise,” a conversation between Israeli writer Etgar Keret and Mexican author Juan Villoro (moderated by the perfectly tri-lingual Ángel Gurria-Quintana). Keret read (in Hebrew) the only story he has written in a public space (while, he claims, squashed uncomfortably into the middle seat on a plane between two large Romanians) and Villoro read an extensive fragment from his novel Arrecife. Both Arrecife and Keret’s Suddenly, a Knock on the Door were recently released in Portuguese translation. The writers also told personal stories: Keret spoke about his parents, both Holocaust survivors, and Villoro reminisced about his philosopher father, who had once opened a revolutionary taquería that was doomed to fail because the menu was so revolutionary that there was nothing recognizable on the menu. The two writers spoke about borders, violence, humor, and the role of fiction. When someone could not resist drawing Keret into politics and asked him about Brazil’s decision to pull their diplomats out of Israel, the writer responded quickly. “I think it’s stupid,” he said, adding, “the more fearful people are, the more aggressive they tend to become. Ask me during better times.” His response was beautifully dismissive and allowed the panel to turn back to literature, which, Keret noted, builds empathy (particularly necessary in conflict zones). As part of FLIPMais (one of the offshoots of the main program), writers José Luiz Passos (Brazil) and Sam Byers (U.K.) spoke with translators Paulo Henriques Britto and Daniel Hahn about translation. Passos compared being a translator to putting on the sweaty shirt of an athlete you idolize and Britto, who has translated more than 100 books into Portuguese, talked about the importance of suspending disbelief. The translator of Kafka, he argued, is pretending to be Kafka and we accept that. Byers, perhaps playing devil’s advocate, said that he had always thought of translation as a simple mechanical activity until watching translators battle with translating his fiction into Portuguese as part of a translation program funded by the British Council that took place the week before FLIP. At an international event that features so much movement between languages, it is important to make translation visible. During his panel, Duvivier did this by reading “Pardon Anything,” a short text that plays with translations that are far too literal (from his book Ligue os Pontos, but which also circulated widely online during the World Cup earlier this year). Given the multilingual nature of the event, perhaps it is not surprising that Duvivier’s reading was one of the festival’s most popular. Victoria Livingstone is a translator, writer and Ph.D. candidate at Boston University, currently based in São Paulo with the support of a Fulbright grant. Song from the Underworld, her translation of Pablo García’s Maya poetry is forthcoming (Achiote Press) and she is currently at work on translating Antonio Ochoa’s El Toro de Hiroshima. Victoria is featured in issue 299.3, Summer 2014. Images provided by Victoria Livingstone.